The Most Professional OEM/ODM Ceramic BBQ Grill Manufacturer. 1.Taste great, it offer a superior charcoal taste and the ability to cook food at high temperatures and have it retain its moistness. 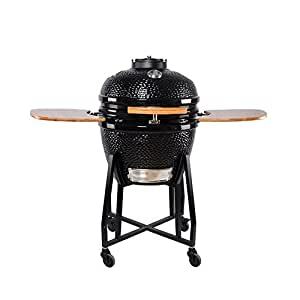 2.Versatile function, it has a wide temperature range, plus its accessories, kamado can be used cooking, baking, grill, smoking. 3.Energy efficient, as its sealed container and the heat retention of ceramic construction. 4.Easy to clean, glazing outside and very easy to clean. 5.More healthy, cooking in ceramic bbq grill is more healthy compared with metal bbq. 6.Start quickly, you’ll be grilling in 3 mins use our Ignition Device (DH2000). The Red Sun stands alone as the most versatile barbecue and outdoor cooking product on the market, with more capabilities than all other conventional cooker combined. Sear steaks, chops, burgers and seafood with a flavor-packed crust unmatched by other grills. The insulating ceramics of the red sun allow for precise temperature control even at low heat. You’ll enjoy succulent results with turkey, ham, ribs or any of your favorite cuts. The Red Sun will bakes your bread, casseroles, cakes and pies better and quicker than your chicken oven. And get ready for the best pizza you’ve ever eaten-at home or at a pizzeria.